Given my recent immersion in LinkedIn as a result of TalkFloor social media marketing interviews, I jumped at the opportunity to talk LinkedIn with fellow Content Marketing Institute contributor, Bernie Borges, author of the Find and Convert Blog about inbound marketing strategies. 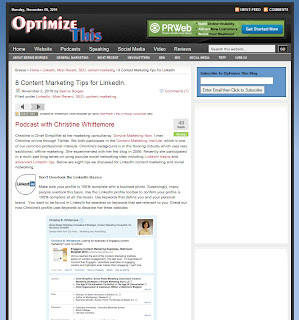 The resulting 27 minute podcast and summary notes are available by clicking on 8 Content Marketing Tips for LinkedIn - Podcast with Christine Whittemore. I thoroughly enjoyed comparing notes about LinkedIn with Bernie. Our conversation took place via Skype; we both had one another's LinkedIn profiles on screen to refer to which made for interesting observations! 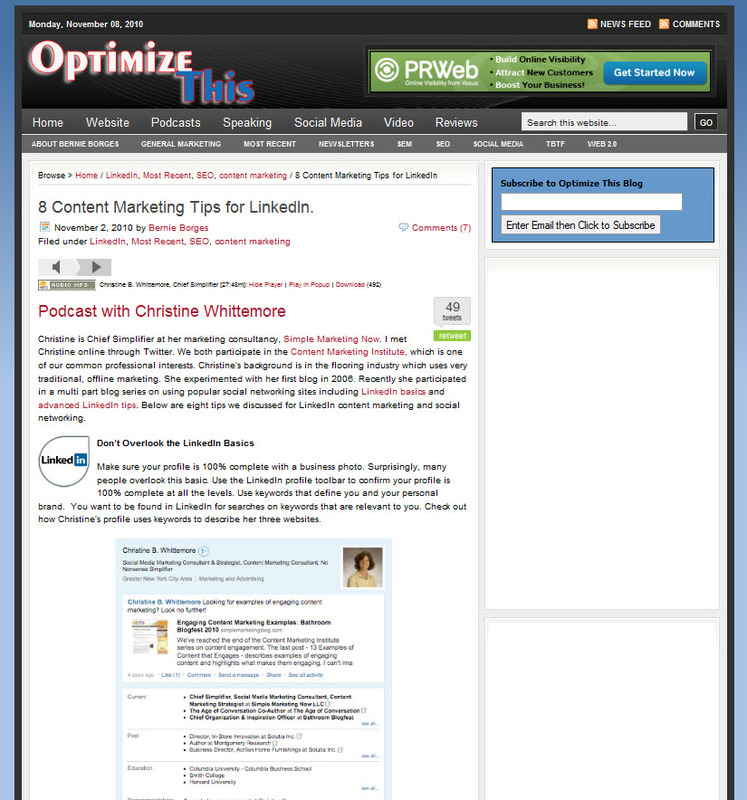 Bernie's summary notes detail the highlights and serve as a valuable summary of how best to approach LinkedIn with a content marketing perspective. My favorite points: paint a clear picture of yourself, tell a story and do profile mining to uncover opportunities to connect. I encourage you to listen to the podcast, read through the notes and let me know which points you find most interesting. Thank you, Bernie, for this wonderful opportunity to talk LinkedIn content marketing. I look forward to continuing the content discussion! I enjoyed our podcast recording very much. I'm confident we provided useful tips even for experienced LinkedIn users. Evelyn, I am so pleased to hear that the podcast with Bernie offered you valuable tips. Please let me know which you find most helpful. I find it really helpful to step back on a regular basis and reexamine where I am with my profile. Thanks for stopping by and good luck with your book. Based on Evelyn's comment, I'd say we absolutely have! I really enjoyed it! The more people talk and write about the higher level of professionalism, and professional use, of LinkedIn, the better! I am a big fan of being able to use a legitimate networking tool that boasts a recognizable perception of "above the fold" social networking in professional fields. Today, having a profile on LinkedIn still means something to fellow professionals, prospective employers and, most beneficially for me personally, is the use it has in growing my business through good reputation. Having a profile on Facebook or Plaxo or any of the other scores of like-minded social sites just doesn't cut the mustard. I'm sure we all remember when Facebook started and began to grow, it was a largely adult arena; these days we are seeing it slip into the tar pit of MySpace with teenagers littering about. Let's keep talking about LinkedIn's professional status and keep working together to keep it that way. Scott, I like how you hone in on the benefits of LinkedIn. It truly is a marvelous business tool especially given all of the enhancements they have added. Thanks for listening and visiting. I really enjoyed the podcast (my first blog-related). You and Bernie have a great style together that is informative and fun. Great tips and inspiration to focus on getting that profile 100% complete! 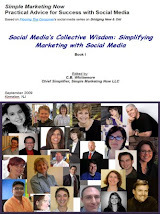 Goal: complete my profile and check LinkedIn several times a week!